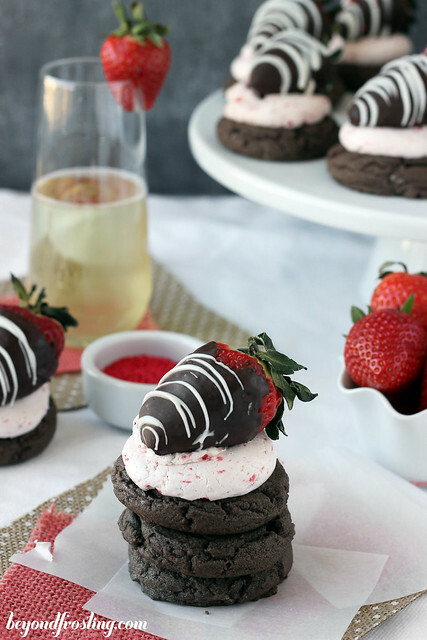 We are taking a break from last weeks skinny treats to bring you these Chocolate Covered Strawberry Cookies. Really, I could not wait any longer to share these with you guys. 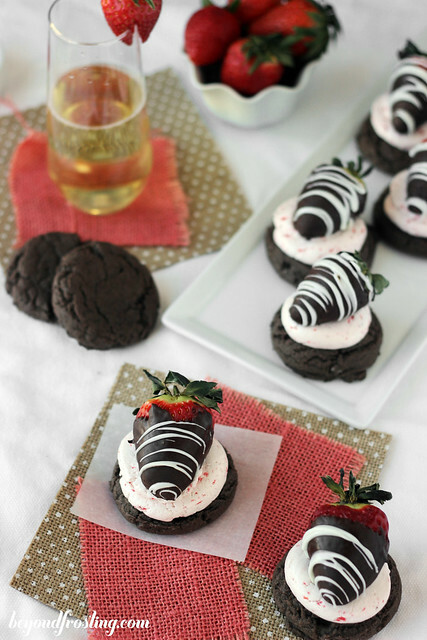 I made these over our Christmas vacation and I felt like you might shame me for posting a Valentine’s day themed recipe so early. In all fairness, Target put out Valentine’s day stuff on December 26th, so I think I am all good here right? 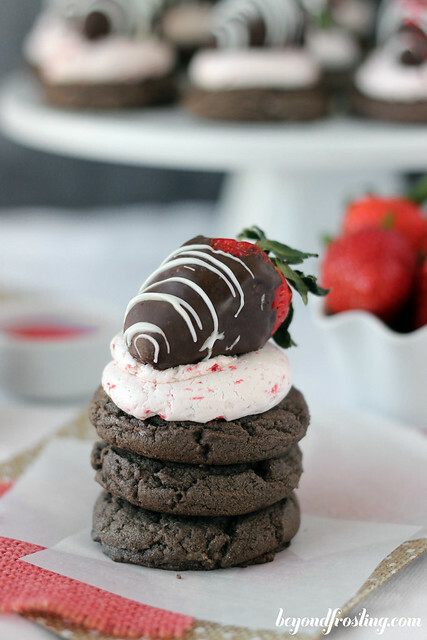 These cookies start with a chocolate cake mix cookie, then they are layered with a Strawberry Swiss Meringue Buttercream and topped with a chocolate covered strawberry. I could not think of a better dessert to keep all to myself. I am pretty sure I am the last person on the planet to discover cake mix cookies. Like, where have you been all my life? I first made a cake mix cookie when I made these Key Lime Cheesecake Cookie Cups, but I have never actually made a non-cookie cup version of a cake mix cookie until I made these. They are freaking dreamy. 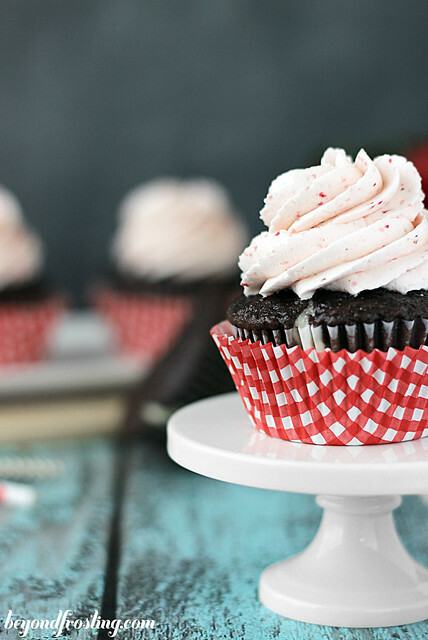 They are soft, packed with chocolate flavor and slightly taste like chocolate cake too! 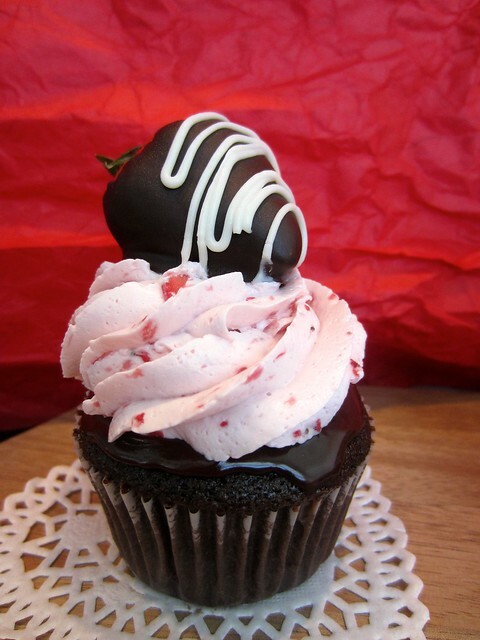 I am a huge fan of chocolate covered strawberries. My boyfriend usually gets me a box for Valentines day, and lucky for me, I don’t have to share. 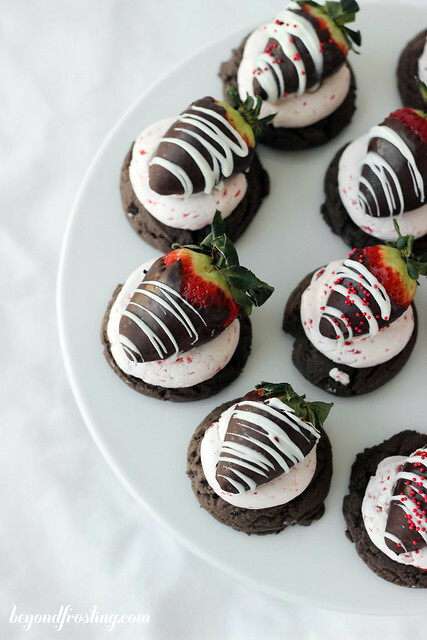 For this recipe, I made the chocolate covered strawberries the night before I made these cookies. I kept them covered in tin foil at room temperature. Whenever I have put them in the fridge, they usually end up with condensation which is no good. 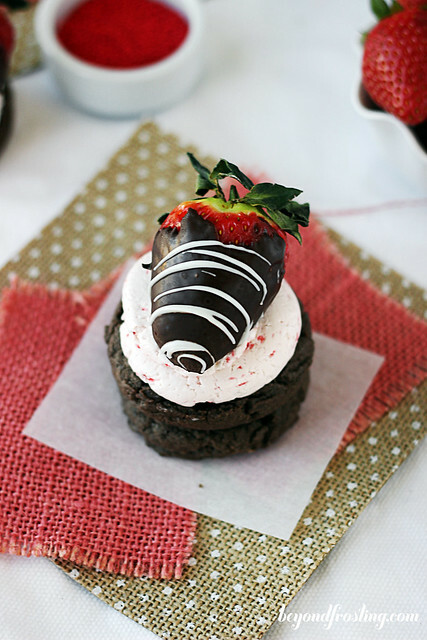 The strawberries are so easy to make. It will be way easier if you use melting candy like Candiquik or Ghirardelli. The chocolate melts to the perfect consistency for dipping. If not, you can melt chocolate chips, and use Crisco or oil to help thin it out. Combine the Crisco (or oil) with the chocolate chips before melting. 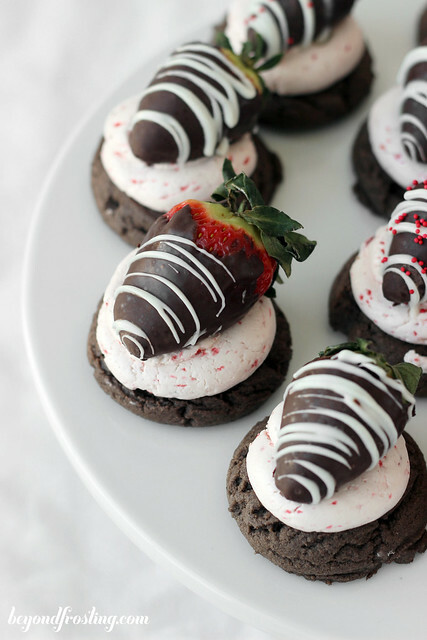 Dip the strawberries and tap off the excess chocolate. Lay out on parchment paper or a Silpat to dry. I usually move the strawberries slightly after the first 15 minutes so that the bottom doesn’t stick and become messy when I try to remove it. For the frosting, I made a fresh strawberry Swiss Meringue buttercream. This type of frosting uses granulated sugar that is heated with tempered egg whites. Then it is whipped at a high speed to form a meringue like texture at which time you add in a bunch of butter. You must use unsalted butter. The frosting is further whipped to become the lightest frosting you will ever eat. 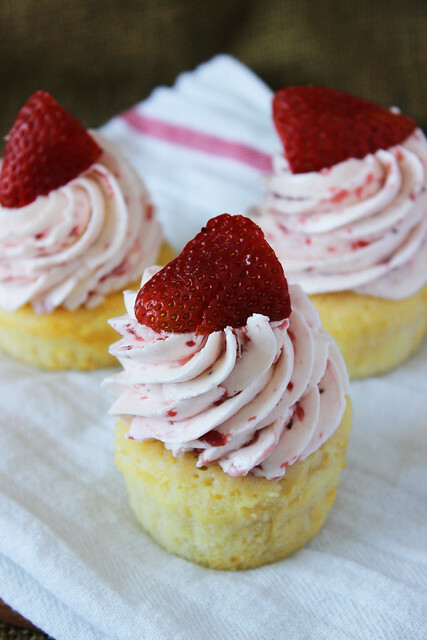 This recipe uses a fresh strawberry puree, which elevates both the taste and texture of this frosting. I love Swiss meringue buttercream because it is much less sweet than your typical frosting made with powered sugar. However, it does take a bit of work and there are a few thing you need to do before you make it. I have a great tutorial for making Swiss Meringue buttercream, so be sure to read all my tips before you start. It would be a shame to waste the time and ingredients needed for this recipe if you try to take shortcuts. To assemble the cookies, I piped the strawberry buttercream on top of the cupcakes using a wide, open circle tip and then plopped a strawberry on top. They were quite well received by my friends who were more than happy to take these off my hands over the break! 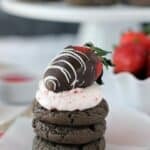 These cookies start with a chocolate cake mix cookie, then they are layered with a Strawberry Swiss Meringue Buttercream and topped with a chocolate covered strawberry. In a separate bowl, combine flour, cake mix, baking powder, salt and cocoa powder. Stir and set aside. Soften butter in the microwave for 15 seconds. Combined softened butter and sugar in a mixing bowl. Beat on medium speed until light and fluffy, 2-3 minutes. Add egg and vanilla extract and beat until well combined. Reduce mixer to low speed and slowly add dry ingredients. Once combine, increase speed to medium high and beat for 1-2 minutes until soft dough forms. Spoon 2 tbsp of cookie dough onto a lined baking sheet. Bake at 350° F for 10-12 minutes. Allow cookies to cool on the pan for several minutes before transferring to a wire rack. Puree strawberries using a food processor. Set aside. Temper egg whites and sugar in a heat-proof bowl over a pot of simmering water on medium heat. You need just enough water to cover the bottom of the pot, about 1 inch. Heat the egg whites and sugar to 150-160°F, ensure the sugar as dissolved. Make sure to stir constantly to avoid cooking the egg whites. Reduce mixer speed to low and add butter 1 tbsp at a time, ensuring each addition is well mixed. After all the butter has been added, change to paddle attachment and continue beating on medium to allow all the air bubbles to escape. In about 3-5 minutes until the frosting is smooth. Add pureed strawberries and mix until combined, careful not to over mix. Serve the same day or you can refrigerate in an air-tight container for up to 3 days. If refrigerated, you will need to bring it to room temperature (about 4 hours) and remix using the paddle attachment for about 5 minutes. Wash strawberries and thoroughly dry with a paper towel. In a microwave-safe dish, melt Candiquk in 30 second increments, stirring after each 30 seconds. Repeat until chocolate is melted. Use two toothpick and stick it in the end of your strawberry. Dip strawberry into Candiquik and swirl to coat the strawberry. Lift up and shake off extra chocolate. Place on parchment paper or Silpat non-stick baking sheet and allow chocolate to harden. 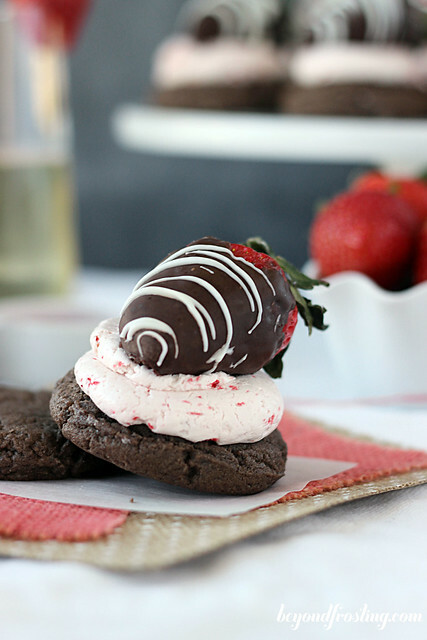 To assemble the cookies, pipe frosting onto top of cooled cookie and place a chocolate covered strawberry on top. Keep covered at room temperature. Consume within two days. 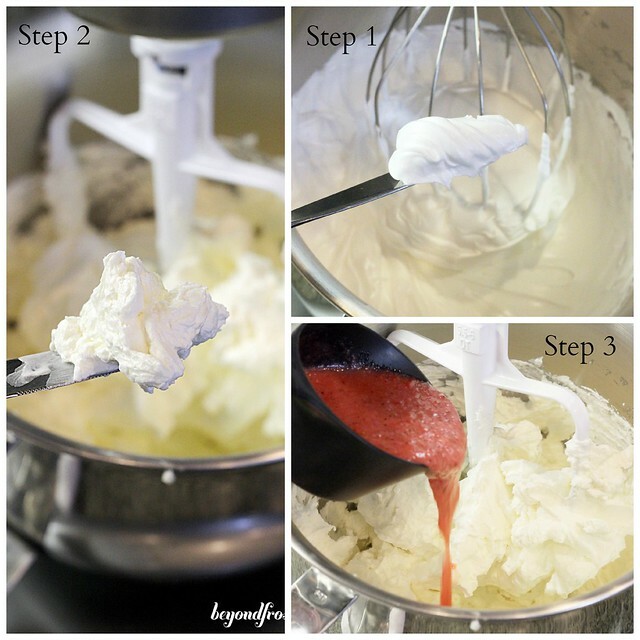 Be sure to read my tutorial for how to make Swiss Meringue Buttercream before attempting this recipe. 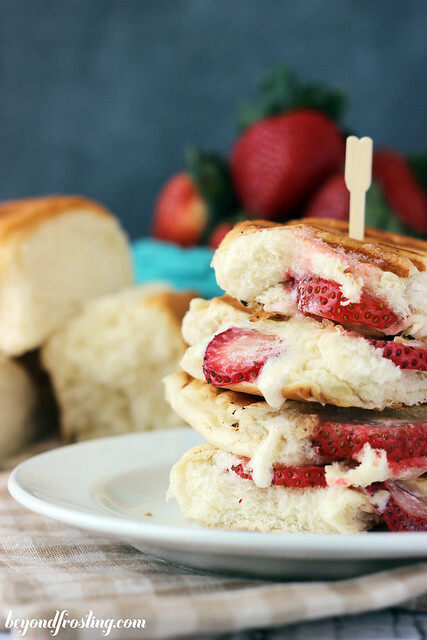 uh, these look way too good and I want to make them today!!! I am still drooling! Yes, these are a must!